to find the bones of this fishibian. Lately I have been reading Jerry Coyne’s Why Evolution is True. And so far it is a fascinating read. What is so great about this book for a scientist is that it gives the big picture on evolution. This sort of thing can be hard to get sometimes because we scientists are so specialized. As I like to tell people, I worked on a single amino acid of a single human protein for my postdoctoral project. For three years. Coyne’s book synthesizes genetics, anatomy, biogeography, physiology, paleontology, geology, and lots of other “ologies” to show how strong the case is for evolution. This is great for me because, of course, I tend to focus on genetics and molecular biology and spend less time on the other fields. Which means I miss important, subtle nuances to some big findings. For example, I had heard about the fossil of Tiktaalik roseae that was found in 2004 that linked fish to amphibians. This was a huge deal because the animal that the bones came from had characteristics of both fish and amphibians. And it appeared in the fossil record at the right time to be a transitional animal between the two. What I hadn’t fully appreciated was that the scientists decided to look where they did based on how old they thought the fossil should be. In other words, they were able to use the theory of evolution to predict where to find the fossil they were looking for. They knew from previous fossil finds that something like Tiktaalik roseae would have appeared between 360 and 390 million years ago. The scientists also knew from previous research that the beast would have been in freshwater. So they got out a geological map and looked for places that met these criteria. They settled on Ellesmere Island in Canada and after five years, they found this marvelous fossil. This is important for a lot of reasons. One is that it obviously tells us a lot about how vertebrates emerged onto dry land. Another is that it provides further validation of geological dating methods. They had to rely on these methods to know where to look for the fossil and the methods worked. This find is also important because it is based on a prediction made by evolutionary theory. Around 390 million years ago, the only vertebrates were fish. By 360 million years ago, there were four-footed vertebrates on land. So the scientists looked in a place that was 375 million years old. Scientists used evolution to make a testable prediction that turned out to be true. And evolution came through with flying colors like any good scientific theory should. Is Tiktaalik really all it’s cracked up to be? I’m afraid Coyne may be a little behind the times, or maybe he’s ahead of his time? PBS’s “Judgment Day: Intelligent Design on Trial” featured Tiktaalik as their premier transitional fossil (an anachronism since the fossil wasn’t even reported until months AFTER the Dover trial concluded). Michael Coates, an evolutionary biologist at the University of Chicago, called the new findings “intriguing” but is not convinced that the digit-like structures in Panderichthys’s fin are the equivalent of our fingers. For one thing, they seem unusually flat for radial bones, Coates said. The structures are so peculiar, they might just be fragments of damaged bone, he added. tetrapods, then “finger development took a step backward with Tiktaalik, and that Tiktaalik’s fins represented an evolutionary return to a more primitive form.” In other words, at least some of the alleged similarities to tetrapods found in these fossils do not actually represent features that are homologous to tetrapods, i.e. they are convergent similarities, also called homoplasies. This means that similarities between these lobed-finned fish fossils and tetrapods imply homology, except for when they don’t, making the Darwinian rationale for inferring “homology” appear weak and arbitrary. My main observation is this: if Panderichthys is dethroning Tiktaalik as the icon of the fish-to-tetrapod transition, what does that say about all the hype we’ve seen surrounding Tiktaalik? It says that “poor” and “primitive” Tiktaalik was never all it was hyped up to be. Panderichthys possesses relatively few tetrapod synapomorphies, and provides only partial insight into the origin of major features of the skull, limbs and axial skeleton of early tetrapods. In view of the morphological gap between elpistostegalian fish and tetrapods, the phylogenetic framework for the immediate sister group of tetrapods has been incomplete and our understanding of major anatomical transformations at the fish-tetrapod transition has remained limited. 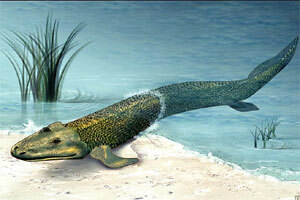 Now that Panderichthys is back in vogue, they are attacking Tiktaalik as a fossil of “poor” quality with radials that “did not seem to match the way modern fingers and toes radiate from a joint, parallel to each other.” But with Tiktaalik dethroned, it seems that there are many reasons to critique its would-be successor, Panderichthys. Darwinists are famous for making retroactive confessions of ignorance, where they only admit how poor the evidence was for a given fossil transition after some new fossil (which supposedly better demonstrates evolution) is reported. Darwinists have used this approach multiple times in the past when discussing the alleged fish-to-amphibian evolutionary transition. I can assume by the lack of response, that Dr. Starr is re-thinking the value of Coyne’s fable? Dr. Barry Starr (@geneticsboy) is a Geneticist-in-Residence at The Tech Museum of Innovation in San Jose, CA and runs their Stanford at The Tech program. The program is part of an ongoing collaboration between the Stanford Department of Genetics and The Tech Museum of Innovation. Together these two partners created the Genetics: Technology with a Twist exhibition. You can also see additional posts by Barry at KQED Science, and read his previous contributions to QUEST, a project dedicated to exploring the Science of Sustainability. KQED's team of science educators and producers bring you engaging, relevant science and engineering resources for educators, students and lifelong learners. QUEST is a project of KQED Science and KQED Education. Funding for KQED Learning is provided by the Koret Foundation, the Cisco Foundation, David Bulfer and Kelly Pope, the Horace W. Goldsmith Foundation, the Mary A. Crocker Trust, and the members of KQED. Support for KQED Science is provided by HopeLab, the S. D. Bechtel, Jr. Foundation, The David B. Gold Foundation, The Dirk and Charlene Kabcenell Foundation, The Vadasz Family Foundation, the John S. and James L. Knight Foundation, Gordon and Betty Moore Foundation, the Smart Family Foundation and the members of KQED.